The NMCC therefore had a critical role to play that day. And yet evidence reveals that emergency actions conducted from the center were totally inadequate. Numerous obstructions occurred, including technical problems and outside agencies failing to provide the center with the information it required. Furthermore, a number of military leaders were particularly slow in reaching the NMCC, from where they could assist emergency response efforts, and only arrived there after the attacks ended and it was too late to make a difference. The evidence currently available is insufficient to draw firm conclusions from. But the sheer number of factors that hindered the actions of those in the NMCC, combined with several oddities, raises the possibility that a deliberate and coordinated attempt was made by treasonous U.S. government and military insiders to sabotage the center's ability to respond to the 9/11 attacks, at a time when its rapid actions were imperative. According to Leidig, the NMCC "then became a focal point for coordinating information flow." And yet evidence suggests a level of urgency among those in the center far less than we might reasonably expect, considering this was the first attack on America in 60 years. Mangino has said that "he knew he would have little time in the days ahead, so he quickly ran to the concourse to get some money out of an automated teller machine." He only arrived back at the NMCC sometime after 9:37 a.m., when the Pentagon was hit. Would a military officer in such a key position really have popped out to get money from an ATM if he genuinely believed the U.S. was in the middle of a massive terrorist attack? It is plausible that this calmness was simply an example of the professionalism of the NMCC personnel. As Mangino noted, "We train for emergencies all the time and that training took over." But other evidence of the NMCC personnel's lack of urgency makes this possibility seem less likely. It is particularly notable that the man who should have been in charge of the center's response to the crisis was allowed to remain in a pre-scheduled meeting, unrelated to the attacks, and did not return to his post until more than an hour after the second WTC tower was hit. Brigadier General Montague Winfield should have been on duty as the deputy director for operations (DDO) in the NMCC throughout the 9/11 attacks, in command of the operations team there. The DDO's responsibilities in a crisis include establishing and moderating an appropriate conference call between military commanders and other relevant agencies, and generating a military response. But, curiously, the previous afternoon, Winfield asked his colleague, Charles Leidig, to take over from him as DDO for a portion of his duty on the morning of September 11, and Leidig agreed to do so. One would reasonably expect someone to have fetched Winfield from his meeting when the second plane hit the WTC and officers in the NMCC "knew immediately that it was a terrorist attack," if not before. And yet that did not happen. Winfield only returned to his post more than an hour later, after Flight 93 apparently crashed in Pennsylvania and the 9/11 attacks had ended. It is unclear if Winfield and the other officers with him in the meeting were informed immediately of the second attack. It is also unclear when exactly Winfield arrived back in the NMCC, and whether he then resumed his duties as DDO immediately, or instead allowed Leidig to continue in his place even while he was available to return to his post. Leidig told the 9/11 Commission he was "certain that Winfield returned" from the meeting "after the Pentagon was hit" at 9:37 a.m. He also said Winfield took over from him as DDO "right after we resolved what was going on with United 93," meaning at some time after 10:03 a.m. Leidig added that a report over a conference call at 10:37 a.m., about an anonymous threat made against Air Force One, occurred "right after I was relieved on the watch by General Winfield." This would suggest that Winfield returned to his post at around 10:30 a.m. The closest the 9/11 Commission came to providing an explanation for Winfield avoiding his crucial responsibilities, and instead staying in an unimportant, pre-scheduled meeting, was to state in a memorandum that "such meetings" as Winfield was attending "are generally not disturbed unless the reason is significant." But a major terrorist attack in the U.S. was highly significant. So why didn't Winfield immediately return to his post when the second WTC tower was hit? And why didn't anyone in the NMCC promptly fetch him from the meeting at that time? EMERGENCY CONFERENCE ONLY BEGAN AT 9:29 A.M.
At least two factors that contributed to this alarming delay in establishing the conference have been identified: disruption resulting from some NMCC officers having to participate in another conference call that was reportedly of no use in aiding the emergency response to the attacks, and problems connecting some agencies--particularly the FAA--to the NMCC's conference. The explanations that have been put forward for these difficulties connecting the FAA to the conference have been vague at best. One 9/11 Commission memorandum attributed them simply to "technical problems." Leidig told the 9/11 Commission it was his understanding that there had been some "compatibility issues" between the FAA's secure phone and the secure phones in the NMCC, though he said he was unaware of the technical aspects of the problem. 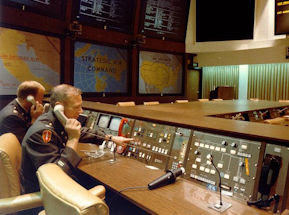 In light of the numerous other factors that disrupted the NMCC's emergency response that morning, it would be worth carefully investigating whether these problems were in fact the result of a deliberate attempt to sabotage communications between government agencies, so as to make sure the attacks on New York and Washington proceeded unhindered. What is more, when an FAA representative finally joined the air threat conference, at 10:17 a.m., that person was far from adequate for providing the conference with the information it required. The representative was Rayford Brooks, who was working in the Central Altitude Reservation Function (CARF) at the FAA's Command Center in Herndon, Virginia. Brooks was a most inappropriate person to have representing the FAA on the conference. According to the 9/11 Commission Report, he had "no familiarity with or responsibility for hijackings, no access to decisionmakers, and none of the information available to senior FAA officials." Considering the critical role the FAA was required to play in responding to aircraft hijackings, we could reasonably expect a far more knowledgeable FAA employee than Rayford Brooks to have been participating in the NMCC's conference when hijackings were actually taking place. With all the people working at the FAA's Command Center that morning, was there really no one more suitable available? • As already mentioned, Brigadier General Montague Winfield left his position as the deputy director for operations in the NMCC at 8:30 a.m. and only resumed his duties after the attacks ended, apparently around 10:30 a.m.
Any new investigation of 9/11 would need to determine the extent to which the absence of these key officials from the NMCC hindered the military's response to the attacks. In light of all the other suspicious evidence, it should be seriously considered whether the absence of any of these individuals had been pre-arranged as part of a deliberate attempt at paralyzing the U.S. military, to prevent it from stopping the attacks. Even without access to important records like these, the limited evidence that is already available shows that an alarming number of factors hindered the emergency response to the 9/11 attacks that was being coordinated from within the NMCC. Considering the U.S. military's failure to stop those attacks, this is something of much concern. We need to know a lot more about what was going on in the NMCC on September 11. And serious attempts need to be made to determine whether deliberate and coordinated actions were undertaken by treasonous U.S. government and military insiders, to disrupt the efforts of the NMCC to put together an effective response to the attacks. "Washington's Heroes." Newsweek, September 28, 2001; Chairman of the Joint Chiefs of Staff, CJCSI 3610.01A: Aircraft Piracy (Hijacking) and Destruction of Derelict Airborne Objects. Washington, DC: Chairman of the Joint Chiefs of Staff, June 1, 2001. 9/11 Commission, The 9/11 Commission Report: Final Report of the National Commission on Terrorist Attacks Upon the United States. New York: W. W. Norton & Company, 2004, p. 37. Steve Vogel, The Pentagon: A History. New York: Random House, 2007, p. 440; Patrick Creed and Rick Newman, Firefight: Inside the Battle to Save the Pentagon on 9/11. New York: Presidio Press, 2008, pp. 171-172. "Memorandum for the Record: Orientation and Tour of the National Military Command Center (NMCC) and National Military Joint Intelligence Center (NMJIC)." 9/11 Commission, July 21, 2003. Ibid. ; "Memorandum for the Record: Interview With Captain Charles Joseph Leidig, USN, Commandant of Midshipmen, U.S. Naval Academy." 9/11 Commission, April 29, 2004; Jim Garamone, "9/11: Keeping the Heart of the Pentagon Beating." American Forces Press Service, September 7, 2006. 9/11 Commission, The 9/11 Commission Report, p. 35. Jim Garamone, "9/11: Keeping the Heart of the Pentagon Beating." Charles Chambers, "Notes on 9/11, Maj. C. Chambers, NMCC, Made Within the Week of 9/11." U.S. Department of Defense, September 2001. "Memorandum for the Record: Orientation and Tour of the National Military Command Center (NMCC) and National Military Joint Intelligence Center (NMJIC)"; "Memorandum for the Record: Interview With Captain Charles Joseph Leidig, USN, Commandant of Midshipmen, U.S. Naval Academy." "Memorandum for the Record: Interview With Captain Charles Joseph Leidig, USN, Commandant of Midshipmen, U.S. Naval Academy"; Commander Patrick Gardner, 9/11 Commission Interview Part I, Handwritten Notes. 9/11 Commission, May 5, 2004; 9/11 Commission, The 9/11 Commission Report, pp. 4, 35, 462. Chairman of the Joint Chiefs of Staff, CJCSI 3610.01A. 9/11 Commission, The 9/11 Commission Report, p. 19. "Memorandum for the Record: Interview With Captain Charles Joseph Leidig, USN, Commandant of Midshipmen, U.S. Naval Academy." Charles Chambers, "Notes on 9/11, Maj. C. Chambers, NMCC, Made Within the Week of 9/11." "Memorandum for the Record: Interview With Captain Charles Joseph Leidig, USN, Commandant of Midshipmen, U.S. Naval Academy"; Jim Garamone, "9/11: Keeping the Heart of the Pentagon Beating." Richard B. Myers and Malcolm McConnell, Eyes on the Horizon, pp. 151-152. "Memorandum for the Record: Orientation and Tour of the National Military Command Center (NMCC) and National Military Joint Intelligence Center (NMJIC)." Charles Chambers, "Notes on 9/11, Maj. C. Chambers, NMCC, Made Within the Week of 9/11"; "Memorandum for the Record: Interview With Captain Charles Joseph Leidig, USN, Commandant of Midshipmen, U.S. Naval Academy"; National Commission on Terrorist Attacks Upon the United States: Twelfth Public Hearing. "Memorandum for the Record: Interview With Captain Charles Joseph Leidig, USN, Commandant of Midshipmen, U.S. Naval Academy"; "Statement of Capt. Charles J. Leidig, Jr., Commandant of Midshipmen, United States Naval Academy, Before the National Commission on Terrorist Attacks Upon the United States." 9/11 Commission, June 17, 2004. "Memorandum for the Record: Interview With Captain Charles Joseph Leidig, USN, Commandant of Midshipmen, U.S. Naval Academy"; "Statement of Capt. Charles J. Leidig, Jr., Commandant of Midshipmen, United States Naval Academy, Before the National Commission on Terrorist Attacks Upon the United States." National Commission on Terrorist Attacks Upon the United States: Twelfth Public Hearing. Commander Patrick Gardner, 9/11 Commission Interview Part I, Handwritten Notes; Commander Patrick Gardner, 9/11 Commission Interview Take 2, Handwritten Notes. 9/11 Commission, May 12, 2004. David A. Radi, "Intelligence Inside the White House: The Influence of Executive Style and Technology." Cambridge, MA: Harvard University Program on Information Resources Policy, March 1997, p. 12; "Chronology of Events on 9/11/01." Federal Aviation Administration, September 11, 2001; "ACI Watch Log." Federal Aviation Administration, September 11, 2001; Bob Brewin, "The Consumer's Guide to Intel Nets." Government Executive, June 1, 2009. Commander Patrick Gardner, 9/11 Commission Interview Take 2, Handwritten Notes. Charles Chambers, "Notes on 9/11, Maj. C. Chambers, NMCC, Made Within the Week of 9/11"; "Memorandum for the Record: Orientation and Tour of the National Military Command Center (NMCC) and National Military Joint Intelligence Center (NMJIC)." Rayford Brooks, 9/11 Commission Interview, Handwritten Notes. 9/11 Commission, April 15, 2004; 9/11 Commission, The 9/11 Commission Report, pp. 37, 463. 9/11 Commission, The 9/11 Commission Report, p. 37; Steve Vogel, The Pentagon, p. 428. Assistant Secretary Clarke Interview With WBZ Boston. WBZ Boston, September 15, 2001; Torie Clarke, Lipstick on a Pig: Winning in the No-Spin Era by Someone Who Knows the Game. New York: Free Press, 2006, pp. 218-219. Don Van Natta and Lizette Alvarez, "A Hijacked Boeing 757 Slams Into the Pentagon, Halting the Government." New York Times, September 12, 2001; Alfred Goldberg et al., Pentagon 9/11. Washington, DC: Defense Department, Office of the Secretary, Historical Office, 2007, pp. 130-131. Robert J. Darling, 24 Hours Inside the President's Bunker: 9/11/01 The White House. Bloomington, IN: iUniverse, 2010, pp. 108-109. Draft: The Air Traffic Organization's Response to the September 11th Terrorist Attack: ATC System Assessment, Shutdown, and Restoration. Federal Aviation Administration, March 21, 2002, p. G-1; Hugh Shelton, Ronald Levinson, and Malcolm McConnell, Without Hesitation: The Odyssey of an American Warrior. New York: St. Martin's Press, 2010, pp. 430-432. Richard B. Myers and Malcolm McConnell, Eyes on the Horizon, p. 159. Richard Myers, Interview by Jim Miklaszewski. NBC News, September 11, 2002; "History Makers Series: General Richard B. Myers, U.S. Air Force (Retired), Former Chairman of the Joint Chiefs of Staff." Council on Foreign Relations, June 29, 2006. Interview, General Richard B. Myers, Chairman of the Joint Chiefs of Staff, With Petty Officer Quinn Lyton, USN. Armed Forces Radio and Television Service, October 17, 2001; Richard Myers, Interview by Jim Miklaszewski; Richard B. Myers and Malcolm McConnell, Eyes on the Horizon, p. 8. Interview, General Richard B. Myers, Chairman of the Joint Chiefs of Staff, With Petty Officer Quinn Lyton, USN; Richard Myers, Interview by Jim Miklaszewski; "Statement of General Richard Myers, USAF, Chairman Joint Chiefs of Staff, Before the National Commission on Terrorist Attacks Upon the United States." 9/11 Commission, June 17, 2004; "History Makers Series: General Richard B. Myers, U.S. Air Force (Retired), Former Chairman of the Joint Chiefs of Staff." "Memorandum for the Record: Interview With Richard Myers, Affiliated With NORAD." 9/11 Commission, February 17, 2004. Richard B. Myers and Malcolm McConnell, Eyes on the Horizon, pp. 152-153. Patrick Creed and Rick Newman, Firefight, p. xvii. Chitra Ragavan and Mark Mazzetti, "Pieces of the Puzzle." U.S. News & World Report, August 31, 2003. Have you seen this video of a plane at the Pentagon?